Upcoming in film music: Schifrin, Jarre. Film Score Monthly reports that the score to the spy film The Fourth Protocol (1987, book by Frederick Forsyth) will be out shortly after long unavailability; Lalo Schifrin is the composer (best known for the Mission Impossible theme). Also interesting is the list of top sellers on the FSM Web site; no. 1 is the not yet released, limited-edition score to The Train (dir. John Frankenheimer and featuring Burt Lancaster, 1964) composed by Maurice Jarre. 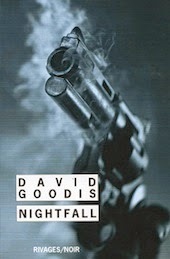 David Goodis...To a Pulp (2010). The documentary David Goodis ... To a Pulp seeks to illuminate the life and work of a major figure in American noir through interviews with relatives and associates and an examination of real-life influences on his fiction. Goodis was the first husband of Elaine Astor, the mother of filmmaker Larry Withers. Recalling two Army nurses' deaths, 1917. WWI Army nurses. Chicago Examiner 22 May 1917: 3. As the centenary of the outbreak of World War I approaches, let us remember on this Memorial Day the nearly 200 American women who died in the line of duty during the war. 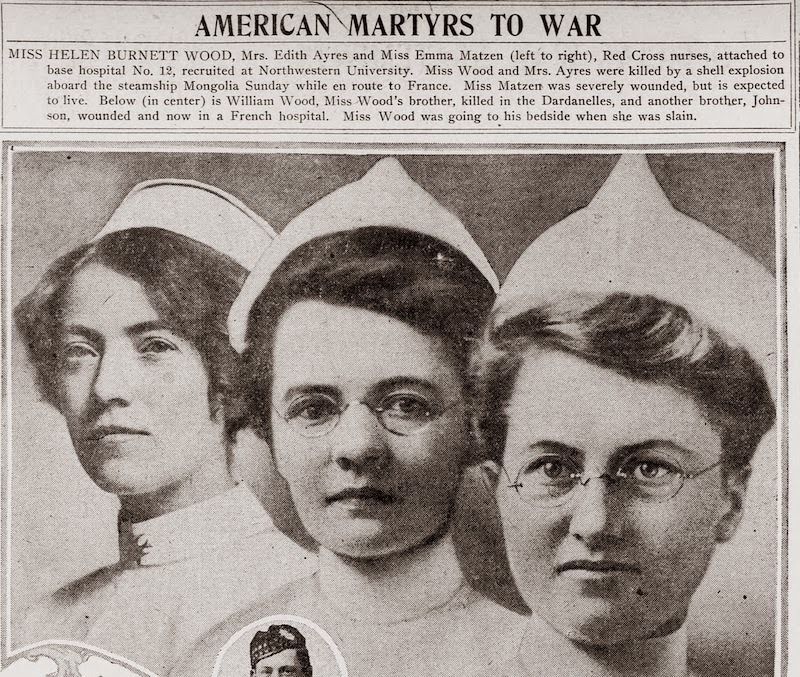 Many of their deaths are attributed to the flu epidemic, but there were deaths such as those of Army nurses Helen Burnett Wood (Evanston, IL) and Edith Ayres (Attica, OH). En route to France, they were hit by a ricocheting shell on May 20, 1917, as the SS Mongolia conducted target practice; their fellow nurse, Emma Matzen (Columbus, NE), was injured. The official Senate inquiry provides graphic details about the incident. Wood and Ayres were buried with military honors; Matzen recovered and went on to duty in France. Arsenic, the Marsh test, and mystery fiction. 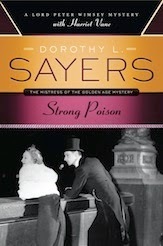 In the May/June 2014 issue of Museum Notes, William B. Jensen (emeritus professor of chemistry at the University of Cincinnati) discusses the Marsh test for arsenic (named for British chemist James Marsh), its first use in a trial, and its place in mystery fiction (mentioning its appearances in Dorothy L. Sayers's Strong Poison and R. Austin Freeman's The Cat's Eye). Hell Is a City (1960). Important in the evolution of the police procedural, Hell Is a City (U.S. book title: Somewhere in This City) was written by ex-police officer Maurice Procter as the first of his Granchester series. 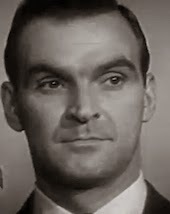 Directed by Val Guest (The Quatermass Xperiment), the film features the always interesting Stanley Baker, Billie Whitelaw, and Donald Pleasence. Baker's Inspector Harry Martineau hunts for an prison escapee in gritty Manchester (filmed on location). 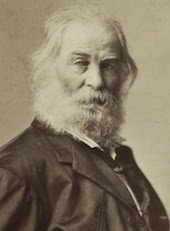 In the "Story of the Week," Library of America features Walt Whitman's "One Wicked Impulse!," which deals with the ironic aftermath of the murder of a unscrupulous lawyer. The introduction to "Impulse" mentions that the story was first published in 1845 and reprinted in the January 1954 EQMM. Rose Macaulay's Mystery at Geneva (1922). "They must be found, gentlemen. Alive or (unthinkable thought) dead, they must be found. The Assembly must do nothing else until this sinister mystery is unravelled. We must employ detectives. We must follow every clue." In catching up with U-Ghent professor Kate Macdonald's podcast Why I Really Like This Book, I was intrigued by the episode on Dame Rose Macaulay's Mystery at Geneva (1922). 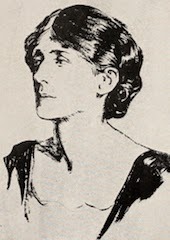 I was familiar with Macaulay (1881–1958) as a satirical novelist (for example, The Towers of Trebizond) and an inspiration to younger Somervillians Vera Brittain and Winifred Holtby, but did not know about this mystery sidelight that features Macaulay's feminist commentary and a journalist investigating disappearing delegates from the League of Nations. "A mystery without distinction," sniffed the Bookman. "[... E]veryone will enjoy Miss Macaulay's running fire of lively and humorous comment upon the human comedy and the fools we mortals are," countered N. P. Dawson in Shadowland. "A fascinating novel," adds Kate (whose specialties include thriller writers John Buchan and Dornford Yates). No Hands on the Clock (1941). Adapted from the novel by screenwriter-author Daniel Mainwaring (who wrote as Geoffrey Homes and is best known for Build My Gallows High, aka Out of the Past), No Hands on the Clock features Chester Morris as a fast-talking PI on the trail of a missing person. He learns that the case is connected to a string of bank heists, which interests the G-men. Jean Parker co-stars. ABA Journal's contest for legal short fiction. The ABA Journal is having a writing contest for legal short fiction; the submission deadline is June 30. In Eight Witnesses, a scientist is murdered, and the only witnesses are eight blind people. Peggy Ann Garner stars in a story by screenwriter Halsted Welles (Alfred Hitchcock Presents, Mannix, 3:10 to Yuma, Rod Serling's Night Gallery). 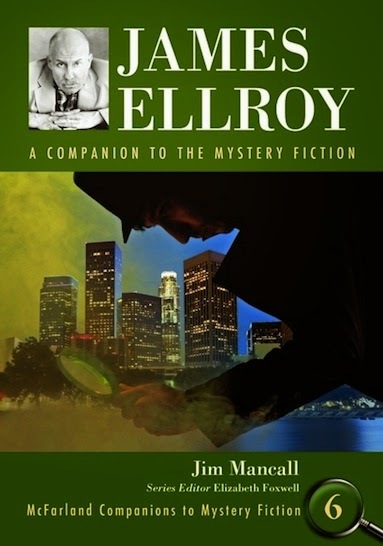 In the Guardian, P. D. Smith has reviewed the James Ellroy companion (written by Jim Mancall and edited by me): "this A-Z guide is an essential key to unlock the complexities of one of America's most distinctive and powerful writers."